(17 Dec 2018). Here are a variety of Christmas styles from Yamaha keyboards. 10 styles specifically for the Tyros5 and Tyros4. Xmas1.zip holds 30 Christmas and alternative styles from TYROS and CVP models. Xmas2.zip has 22 styles from old PSR and various collections. Christmas-S970.zip has 105 Christmas styles for PSR-S970 and S975 with additional GENOS Styles. (15 October 2017) I have made "Oriental Dance Styles" for SFF2 S-Series and Oriental Keyboards. This includes some selected styles from PSR-740, PSR-9000PRO, PSR-2100, PSR-1500, PSR-A1000, CVP-109 & CVP-210. Which use Dance Kit from various categories. Here, I revoiced DanceKit to ArabicMixKit (available only in S-Series and Oriental keyboards). The mostly used drum tones of the old DanceKit (like Techno Kiks and Techno Snares), are given in ArabicMixKit with different notes (Kik B0=F-1, A0=A-1, Snare G0=G-1...) I remaped the drum notes accordingly. Now this gives the same feel of hearing the old Dance styles. Here are some mp3 samples: Clubdance[2k].mp3, DreamDance[2k1].mp3, Eurobeat[9K].mp3, JumboReggae1[9K].mp3, JumboReggae2[2K].mp3. These styles can not play properly in TYROS models. I designed these styles only for PSR-S970, S950, S910, S770, S750, S710, S670, S650, A2000 & A3000 as common. So I left these styles with '.sty' extension. 86 styles are now available in DanceOriental.zip. An Excel file is included in the zip archive..
(August 2016) Here are a number of "Classic Style collections for SFF2 keyboards". Because "Old is Gold," this collection includes styles from 01-PSR-740, 02-PSR-8000, 03-PSR-730, 04-PSR-620&PSR-510. The styles of each keyboard are unique. Originally, I did these conversions for the PSR-3000, all are SFF1 styles. Now, I am doing the conversions in my new PSR-S970. So all of these will be in the SFF2 format. The methodology is same as I did for PSR-3000. Here, I did make some slight voice changes. All these styles carry GM voices in all tracks. For better sound, I revoiced to other related XG voices. Very interestingly, I added OTS to each style by applying DSP effects to each voices (not panel voices but XG voices). In 8000, 730, 620 & 510 styles, I converted 2 variation to 4 variation styles. I copied MainA to MainA&B, MainB to MainC&D. In Fill ins, BA to AA, AA to BB, AB to CC and BB to DD. Except 730 I copied Intro and Ending A to B, and B to C.
PSR-740StylesForSFF2.zip - This is the first set of this Classic Collection. This is for all SFF2 keyboards: PSR-S710, S910, S750, S950, S670, S770, S970 (for S650 the extensions of each style should be changed to '.sty'), TYROS3, TYROS4, TYROS5, CVP-5xx, 6xx, 7xx and also PSR-A2000 and A3000. PSR-8000StylesForSFF2.zip - In 740 and 8000 styles, I revoiced GM GrandPiano to Live!GrandPiano(000-113-001). Because in S970, GM Piano sounds like ConcertGrandPiano. Both keyboards have 5 Sweet! Voices (Trumpet, TenorSax, AltoSax, Clarinet and Flute). But in 740 there is ClassicalFlute, given as regular voice. PSR-730StylesForSFF2.zip - Basically, PSR 730 has only GM voices in all tracks. I revoiced some tracks to panel voices and XG voices. I also revoiced GM Piano to Live!GrandPiano. 730 panel voices have only one extraordinary voice that is Sweet!Trumpet. This keyboard also has lot of unique Styles. PSR-620&510StylesForSFF2.zip - This includes the very most ancient SFF1 styles of PSR-620 (1995) and PSR-510 (1993). In those periods, the top end (master) keyboards were PSR-7000 and 1700. PSR-620 & 510 have IntroB and EndingB. I copied IntroA and EndingA from the master styles. I also added additional unique styles from the masters and added some custom styles from those times. (Aug 12, 2018) I have completed a Standard Styles Collection for Tyros4, Tyros5 and GENOS. For this Standard Collection, I selected all the styles that I did for PSR-S970 Standard Collection. I replaced some PSR voices (voices not in TYROS models). They are some Cool! Guitars and Sweet! Saxophone. All these styles also may be unique. The voices are upgraded up to the standard of Tyros4. (July 9, 2018) I compiled a special YAMAHA Preset Styles Collection for Tyros5. 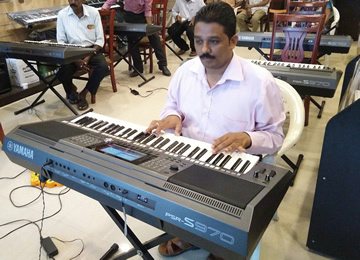 This collection includes unique styles from Top level Keyboards (TYROS & CVP). These styles may not be in the Tyros5 and are also different from Tyros5 styles. Some styles are unique. For others, I selected the best one. I did not edit any styles, just copied and pasted and renamed some styles. (If I did any changes in my S970, the R3 voice in OTS would be removed.) Just view these styles in your T5. If you want to make any changes, do it or keep the same. (February 26, 2019) I expanded my Genos conversion project for the PSR-S970 (see below) to cover the Tyors5 and Tyros4 keyboards adjusting voices as required by these two keyboards. Thanks to Joe Waters for assisting my adding R3 voices to these conversions. The full conversion set is provided in the tables below. These tables are also available on the Tyros5 styles page and the Tyros4 styles page. The GENOS styles have been rearranged as per the TYROS categories with comments as shown in this XL file. All of Onacimus' style conversions for the PSR-S970 are available on the PSR-S970 Styles page along with detailed descriptions of each collection. For simplicity, only the conversions themselves are listed here. This Christmas style collection for PSR S970 is drawn from the Standard, Super Mega, Super Mega Plus and Special collections for S970, which are available below. These styles may also be compatible with the T4, T5, C6, & C7 keyboards. There are 95 styles available in this Christmas-S970.zip file. [This Christmas collection is also avaiable below for the PSR-S950 keyboard.] Wishing everyone a Merry Christmas and a Happy New Year! The Standard Styles collection for the PSR-S970 includes almost 1,300 styles. "Standard" Collection means styles having many extraordinary voices (Sweet, Cool & Live) except Mega voices in tracks and OTS. The collection includes styles from ten keyboards: PSR-9000 and 9000Pro, PSR-740, PSR-2000, PSR-2100, PSR-1500, PSR-550, and CVP-109, CVP-209 and CVP210. It also includes Oriental Styles from the PSR-A1000. For this Collection, I picked styles from PSR-S910 Standard collection, added some more styles, and did slight voice editing. The nearly 1,300 styles in the "Super Mega Styles collection" includes all SFF1 Mega styles from Tyros1, Tyros2, CVP-309, CVP-409, PSR-3000, PSR-S900 and PSR-S700. I also included Oriental Styles from PSR-OR700. The term "Super Mega" means Super Articulation voices in OTS and Mega Voices in tracks. For this collection, I picked all Tyros1 styles as basic and added other styles if they were new and slightly different. I also did some slight revoicing. I put different icons for each style, mostly matching the original. "Super Mega Plus" has Sweet, Live, and Cool voices (like Standard) as well as Super Articulation voices and Mega voices in tracks (like SuperMega) but SFF2 styles. Source keyboards include PSR-S710, PSR-S650, PSR-S910, TYROS3, CVP-509, PSR-950, TYROS4, CVP-609, TYROS5, CVP-709. I have also included Oriental Styles from PSR-A2000 and A3000. (June 10, 2018) Genos conversions added. (June 17, 2018) I expanded the Super Mega Plus Collections by adding the new Plus styles of PSR-S975. I converted all the styles except some Oriental styles that were already included from the PSR-A3000. These styles are placed in Dance, Latin, Ballroom and Entertainer categories. I also added 2 GENOS Styles (R&BSoulBallad in Ballad and RetroDance in Dance) and 'CelticDance3-4' of CVP-709 in World1. I updated the ChartEDM and USClubDance2 styles in the Dance category. All of these changes are in the table below and available separately in this file. (February 26, 2019) My original project to convert Genos styles converted 232 styles as of June 10, 2018. The voices were changed according to the availability of S970 Panel voices. Starting in late August last year, I revised the new GENOS styles by editing the Drum notes by Drum Edit (Drum Setup) function of PSR-S970 and expanded the conversion to cover all Genos styles. This project took five months. The results are available in the table below, which is duplicated on the PSR-S970 styles page. The GENOS styles have been rearranged as per the TYROS categories with comments as shown in this XL file. These conversions are also available for the Tyros4 and Tyros5 as shown above. This style collection includes various Styles from Internet and Expansion Packs. I have updated all the styles and added many new styles in 11 categories. I have converted many Expansion styles. I have remaped the new kits by using the drumkits available in S970. These styles also can be used in TYROS3, 4, 5, CVP-509, 609, 709, S950 and S770. Some styles of Entertainer section need drum remaping in T3, C5 and S950. Because they have no 'HouseKit'. The voice selections are up to the standared of S770. I have assembled a collection of all YAMAHA Indian styles. They are from the Indian2, IndianDevotional, and IndianEntertainer Expansion packs for the PSR-S970. Additional styles are from the S950 Bonus styles of Indian2, S750 Pack and Bonus styles of Indian2, S650 pack and Bonus styles on Indian2 and some preset styles from S710 & S550. I brought together all these styles (95 styles) in one collection by eliminating duplicates. These styles will play well in S970 only if any one of the three Indian packs are installed. A Microsoft XL file is also available. The above collections include styles from many Yamaha keyboards. Onacimus also provides style conversions for the PSR-3000 from specific keyboards. These are also available on the PSR-3000 styles page. Check the PSR-2000 Styles page for a Onacimus' description of this standard styles set. Click here for an Excel file with a list of all the styles and the source keyboards. (8/4/07) Onacimus went through a similar exercise as described above, this time focusing on the PSR2100. The conversions for PSR2100 owners are provided below. My friend recently bought the new PSR-S550. This is an upgraded version of the PSR-S500. Copying and pasting styles, like the PSR1000 through Tyros3, is not possible on this keyboard. However, the S550 includes a "Style Creator". I made these styles by running each one through the S550 Style Creator. First, I saved the style in the user slot as "UserStyle001". I then saved the style to a USB device and renamed it to the exact style name. While saving, I did not make any changes; all styles are in their original tempos. While the S550 preset styles include OTS, when they are saved to the user area, the OTS is not included. The saved styles are like PSR 740 and 9000 styles, which do not have OTS. The styles do have rhythm sections like the standard keyboard (4 Main & Fill Ins, 3 Intros & Endings and Break [Break function is disabled in S550]). These styles have no Mega Voice but do have the standard Live, Cool & Sweet voices with live performances. Also, some of the styles are new in the Dance, Latin and World categories with additional Ethnic Kits. These styles are SFF1 with extension as .sty. They should be directly playable in 740, 9k, ..., 2100 and CVP models. They should sound even better in the Tyros, 3000, and later keyboards because the drum setups are the same. A complete description of the methodology used to convert these styles for use on the PSR-740 is provided on the PSR-740 Styles page.